The old adage “one picture is worth a thousand words,” has lost some of its meaning in the digital age. “One picture,” has been replaced with multiple photo sharing options, polished graphics, high-resolution video and both VR and 3D filming capabilities. But one picture can still tell a story if it’s the right image. Homeless and Housing Umbrella Group, a non-partisan group based in Kitchener, Ontario, is committed to reducing homelessness in their area. 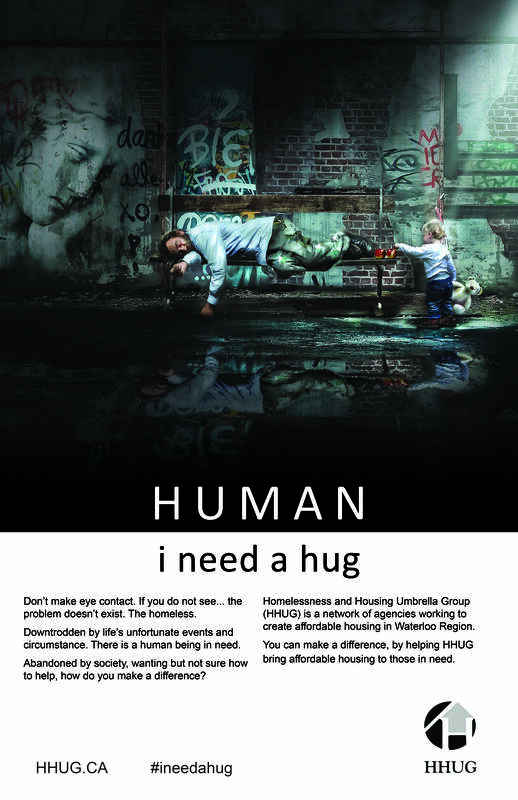 The group approached Creative-Lee, a Waterloo-based creative agency, to produce a poster that would allay the emotion of their mission. The agency created an unforgettable scene featuring a homeless man on a bench and a child showing the man compassion, with compelling copy. The poster combines poignant artwork and to-the-point copy to make a lasting impression. If you’re taking an RV trip, there are a few choices to make, including if you’d prefer regular gas or diesel. If you don’t know what fuel is the best for you, TriComB2B’s video for their client, Cummins, will explain. This video compares the two fuels on a cross-country road trip. The subject matter may sound a bit boring, but the way the information is presented it is anything but. Through sharp dialogue delivered by sensational talent, the road trip is a fun romp through the countryside. Well directed and written, the video also cleverly edited and shot. It moves along at a pace quicker than the RV rolling down I-35. As for the answer to the question: gas or diesel, you have to watch the video to find out. Annual reports, by nature, include very dry financial information about a company’s status each year. Just because the subject matter is dry and often colorless, doesn’t necessarily mean that the report has to be. Federal Grid Company of the Unified Energy system is a Russian company that supplies energy transmission services. Their annual report finds new and creative ways of explaining mission, goals, and data to stakeholders. The report is filled with intricate graphics in vivid colors with concise headings wrapped with a laudable layout. The infographics are not only well designed, but easily readable. The final product is a visually engaging report that entices readers, instead of a dry, text-heavy publication. To see EM’s full project, visit here. Rice shot a series of videos following various “unconventional” students around their daily lives. The profiles include the students’ academics and extracurricular activities, as well as their interests, aspirations and reasons for attending Rice. The well-produced series captures the beauty of Rice’s campus while showcasing each student’s unique story. The featured students’ various backgrounds and future goals highlight the university as an eclectic home for students of all backgrounds, interests and talents. To see Rice University’s full Unconventional Students project, visit here. Marketing goals are not always clear, especially when business is booming. Reevaluating goals is a part of any successful marketing strategy, and even the most successful organizations can benefit from revisiting their objectives. Hawke Media was approached by Lorna Jane, a popular Australian activewear brand, to realize their marketing goals and make the brand’s goals a reality. Hawke Media identified Facebook, AdWords and Influencer Marketing as the most effective routes for Lorna Jane to connect with both current and new customers. The campaign was an overwhelming success, increasing monthly purchases 3x and finishing with a Facebook ROI of 1127 percent, AdWords ROI of 460 percent and a 42 percent increase in Instagram followers. To see the full Hawke Media x Lorna Jane campaign, visit here. The 2018 dotCOMM Awards final deadline has been extended to July 19. Enter ASAP. When choosing a school, many students consider experiencing a college’s campus a key deciding factor. Unfortunately, it may not always be possible for a student to visit a certain school’s campus. Washington College found a way to bring their campus to students nationwide. Washington College created an interactive experience for prospective students and employees who may not be able to visit Chestertown and experience the campus firsthand. Using Google Maps, the college designed a virtual tour of the campus that captures the Washington College spirit. Through the tour, users can “walk” around and get a feel for the campus. Users can navigate through the tour by using the provided prompts, or by using a small map to navigate to any specific locations. The tours have not only served as an excellent resource for prospective students, but also as a recruitment tool for potential faculty and student-athletes. The campus tour has received up to 20,000 views in 36 weeks and is only one of 21 virtual tours Washington College offers. To view the full tour, visit here. The 2018 dotCOMM Awards deadline is today. Enter now.